My baby hasnt been seeing too much road action lately, and the arrival of the rego renewal ( the second since I bought it! ) has only served to remind me of this. Whats that you say, money pit? Hmmmmm. Given the new headers, I asked Staintune if they could send me some ST4 mufflers down for a dyno test session to see what change they made. Always happy to indulge me, they dispatched some and on they went. I had to make up some brackets, as the std brackets get re-used on an ST model, but with my exhaust manufacturing experience, this was too easy ( not really, it involved the usual amount of swearing and tanty throwing, and bits in the bin ). Good time for a photo. For the trainspotters, I should point out that soon after this photo was taken I fitted an original clear screen and round black mirrors. Just for originalitys sake. The dyno graph below shows the result from the Staintune muffler fitment. Before in blue is ST4 headers with std ST4 mufflers. After in red is ST4 headers with Staintune ST4 mufflers. The green line is from the previous report, being std 851 headers and carbon Termis. 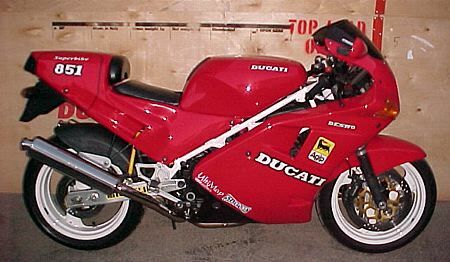 Although only a minor improvement on paper, it certainly changed the character of the bike. Much more responsive and general fun to ride. Made wheelies far, far easier too. Then a couple of problems and a lack of time led to the off-road condition. But, with the installation of the FIM memory board in the ECU, a brand new starter clutch ( complete with new hub and gear ), rebuilt water pump and cleaned injectors, were back on the road. A short comment on the starter clutch as this stage. In the past I have resurrected dodgy starter clutches with a new spring. I found a local spring company who had the right size, I just had to cut down the length. So I thought doing mine would be easy. Just pop off the side, rip out the bits, new spring, refit and away we go. Unfortunately, once I spilled its guts it all went a bit pear shaped. Put simply, this was the most damaged starter clutch I have ever seen. The clutch dogs ( the roundish bits that lock in one direction ) were so damaged that they had metal peening off the edges ( that I could chip off ), and big chunks missing in places. The spring was jammed in, around and under the rollers too. The hub and gear were not much better. Technical term  rooted. After 60,000 km though, this sort of stuff is to be expected. I fitted the new spring, under the old "nothing to lose" banner, but wasnt too confident. It worked great for about 5 days, then nothing. Well, nothing and a water leak from the pump seal, requiring a full water pump rebuild. However, the bike was at work when it let go, so we just put it on the skid and forked it upstairs. Luckily, I had just sold my Moto Guzzi Eldorado that had been occupying a spot in the corner of the spares area for the past few years, so the 851 slotted right in. Looked great, but, frankly, Id rather have been riding it. So after the bits arrived ( Back Order happens to me too ), it was fit and go. The FIM memory board is the same deal as we fitted to the 888 SP4, and turns the Weber P7 ECU into a permanently adjustable unit. The memory board is a great piece, as it lets you adjust every point on the fuel map as you please. This is the way Duane originally configured his chips for the P8 ECU, but most people got so confused with the concept that he went to the zone theory. Which the punters found somewhat less confusing. Pity, but thats life when youre trying to sell something. The chip Duane fitted was his 851 ULTIMAP UM011, not the previous one, but I didnt bother dynoing it, as the previous +/- fuel runs had shown me the best power I would get, regardless of the chip. While I had the alternator cover off the first time I took the opportunity to fit the Ducati Performance lightweight flywheel I had sitting around waiting for such an occasion. Which meant I had to remove it and fit it to the new hub. I was surprised the effect wasnt more immediately obvious, but using some more revs showed a distinct improvement in response toward the top end of the rev range. That, and the need to close the throttle on WOT acceleration in first gear to stop it looping got my attention. Sure as hell surprised me for a slow old 851. The DP flywheel for these P7/P8 models has a steel ring bolted to the outer edge of the alloy centre, which provides the four pickup bumps for the crank sensor. This raises the weight of the flywheel slightly, but it still came in at around 750gm, some 1200gm lighter than std. Anyway, back to the story. The next step in the tuning charade was resetting the cam timing. Given the success Id had with the 996 specs transferred over to the 748, and Doug Lofgrens results from his cam timing investigation, I was keen to do the 851. Easy job given Id previously fitted the VEE TWO adjustable pulleys. I pulled the radiator when I had the coolant out with the alternator cover off so this meant I didnt have to do much disassembly to get the rocker covers off. Of course I decided to remove the injectors ( which involved removing the throttle bodies complete ) to get them flowed and cleaned once I had it all back together, so I could have done the whole thing at once. Thinking ahead? Not this bunny. The result of the cam timing change is shown below. Power first, then torque. Green is before ( cam timing reset to std spec, ST4 exhaust w/STAINTUNE mufflers, no airbox lid ), red after. The usual change  better up to the power peak, same max power and a little less after. Personally I think the smaller valves are probably affecting the top end on this bike compared to the 748/888/916 models, which have 1mm bigger inlet/exhaust. The cursor is set at 7,000 RPM, with max power coming in at 9,000 RPM. Most of the curve shows a 6  8% improvement, which is most obvious on the road. Just what I was after. Its a bit funny to ride. Like the 888 SP models, it revs very quickly without feeling that fast. Surprisingly quickly actually, as the acceleration catches me out sometimes. As does the amount of revs I find myself using. Maybe like a 748 ( which I have been somewhat unusually enjoying riding lately ) with more grunt and wheelies. Makes the same gurgling noise through the airbox as the SPs too. Some are probably wondering about the effect of cleaning the injectors. These early injected bikes ( including 907ie ) have always been dirty idlers, with lots of hydrocarbons and high oxygen in the samples. I checked mine when hot after a ride and was quite shocked at how bad the mixture was. I though then that cleaning the injectors might help, given the age of the bike. The report from Expert Injector Clean showed both to be down about 10% on flow, with poor spray patterns and leaks when closed. After reinstalling and rechecking, the mixture at idle had about half the previous hydrocarbons and oxygen in the sample. Which makes it far nicer for anyone sitting behind the bike, believe me. Also makes it idle lots better. Certainly worth doing to any bike with a few km on it. Ill be getting the 888 ( with 30,000 km ) done as a matter of course. Not sure where Im going to go from here now though. I guess Ill have to follow through and fit the 748 heads, but theres no real point unless theyre ported with bigger valves. More money. Its really nice to ride the way it is, but I just cant stop playing with it now, can I?